Perla Taqueria, Atlanta GA (CLOSED) – Marie, Let's Eat! I don’t know whether they’re ever apparent to you good readers, but I do like to occasionally find some kind of an angle to a chapter here, especially when I write a chapter with two different restaurants. Well, beyond just “here are two places where we ate recently,” I mean. Last week, I thought that I was onto a good one when David suggested that we follow up our lunch at Decatur’s No. 246 with a visit to Perla Taqueria near Cheshire Bridge. He had eaten here a couple of weeks previously, and emailed just about all his local friends as soon as he got back to the office to warn everybody about their incredibly hot sauce. Evidently, he seemed to think that I had not actually read that email when he then told me how I really had to try this place. No matter, I certainly like good, spicy hot sauces, and was willing to give them a try. As we walked back to the car, trying to block out all the ’70s dinosaur rock being piped out of Ruby Tuesday and The Pita Pit, I caught sight of Big Tex Cantina, a little side venture of the good fellows at Fox Brothers, and figured I could make a little two-fer chapter about the tacos at both joints. David and I took our seats, but were surprised to learn that Big Tex is undergoing an interesting menu revision. Perhaps pummeled by the popularity of the tacos at the nearby Taqueria del Sol, Big Tex is slowly abandoning their Tex-Mex menu in favor of traditional southern cooking, turning into a meat-and-three with emphasis on things like chicken and dumplings and pork chops. With three buck tacos no longer on the menu, I decided to snack here some other time. So, onto Perla, to try this wicked hot sauce. The business opened in mid-2011 in a shuttered Mrs. Winners. The prices here are remarkably low – the $3.99 burrito that I ordered was one of the most expensive things on the menu – and I enjoyed the flavors and the goofy design and attitude. I love the lights hanging from the ceiling in old potato chip cans. The food did not knock me out. I had a brisket taco and it really was not as tasty as the one that I enjoyed several days before at El Rey del Taco. The burrito and the taco were satisfying and pleasant, but not spectacular. I’m probably a little more satisfied than Foodie Buddha was with his visit, which is hardly surprising, as Buddha, lovable curmudgeon that he is, seems eternally unsatisfied by everything that he eats, but I’ll still agree that this is probably best sampled as late night hangover-prevention food. I did enjoy the sauces, if not the tiny little chip-defying cups that you can spoon a feeble little bit into, and the hot sauce certainly met David’s description of it being too darn combustible for the unprepared. The one disappointment that I had with the hot sauce was that I couldn’t quite get enough of it. The fellow at the register was apologetic, and told me that the kitchen staff was working on a new batch. Some guest had just left and, in what must be a breach of all restaurant etiquette, filled up on their hot sauce in their own container, leaving only drips and drops behind, barely enough to fill one of Perla’s tiny little chip-defying cups. I spooned up just enough to flavor my food just a bit. Next time I come by to sample their other tacos, I hope to get a little more of it! Posted on January 21, 2012 July 31, 2017 by Grant G.Posted in atlanta, georgia, goodbye, mexicanTagged atlanta, cheshire bridge, closed!, georgia, mexican, mexican - traditional, not fooling anybody. 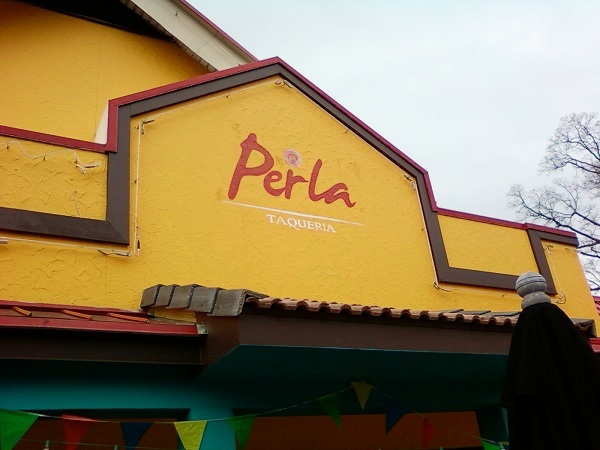 In March 2014, Perla closed. The owners of the nearby Mama’s Cocina Latina are said to be moving into this building.